This topic contains 9 replies, has 2 voices, and was last updated by Andrew Misplon 2 years, 8 months ago. OK. I’ve gone through these and wordpress’s support, I’ve tried every setting and way I can think of to create a custom menu and NOT have the same links show up in the header with my logo. I am a beginner, and I’ve been at this for a month, but I cannot clear this hurdle. I would like to create custom menus, but I CANNOT get rid of the links next to my logo. Please…for the love of all that is holy…help me. I cannot figure out why this is so difficult. There isn’t currently a theme setting to remove the main menu so one way to go about that is just to assign an empty menu to that location. Go to Appearance > Menus, create a new custom menu, add no links or pages to it and then save that menu to the theme’s primary menu location. If I assign an empty menu, I get the pages (as a menu) anyway, just further down the page. I don’t understand how I’m the only one who desires a custom menu can’t get rid of the pages themselves showing up as a menu. This is ridiculous. Is this a theme issue or a wordpress issue? I’ve gone through and read some of your support questions, and you’ve seemed to be quite helpful to others, sometimes jumping right on and redesigning something in your theme. Is this really how you’re going to let this play out? Try an empty menu? Unreal. Thanks for nothing. Nate, that’s a really unfair response. As you might have seen from many of the threads here, it often takes several questions and attempts from our side to find a solution to any given problem. I haven’t stopped helping or trying to find a way to resolve your question. Why jump to that conclusion? My method I outlined in my first reply is what I would have done if it was my own website. Thanks for trying it and letting me know that it didn’t work. Please, send a link to your site so I can inspect the problem and find another way of fixing the problem. I have a site, upon which I use a logo in the header. Next to said logo, there are my pages, and they are my links to said pages. If i add any page to this site, it automatically puts it right there. With the methods I’m using, and granted I am not any kind of expert, I cannot change the above scenario, in any way. This is the result of hours of trying, and more hours sifting through forums and support sites. Others seem to have absolutely no problem with this using your theme and wordpress. Here is my site, and thank you for your time. 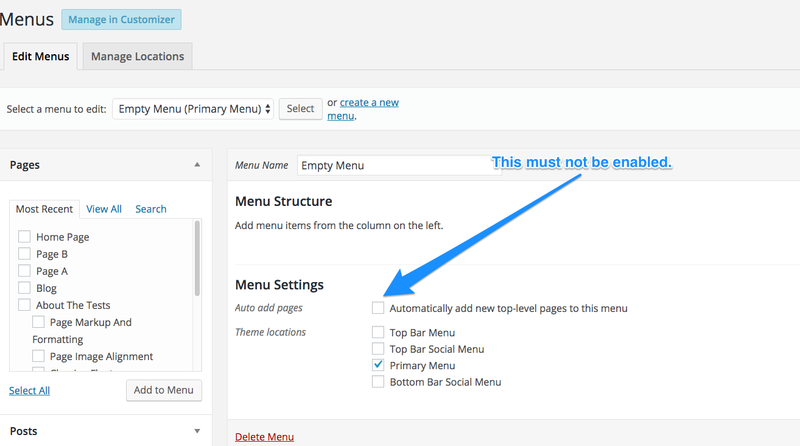 Each menu has a setting called: Automatically add new top-level pages to this menu. Ensure that this setting is not enabled. There is no menu enabled. At all. NONE. I don’t have a menu. Just the pages. That’s expected, if no menu is linked to the theme’s primary menu location it will automatically display pages. There isn’t a theme setting to remove the main menu at the moment so the empty menu method is your best bet to resolve that. The reason it might not have worked previously is because of the setting I outlined in my image above. Thank you for your time, I’ll give it a shot. Sure 🙂 Hope you’re able to resolve.